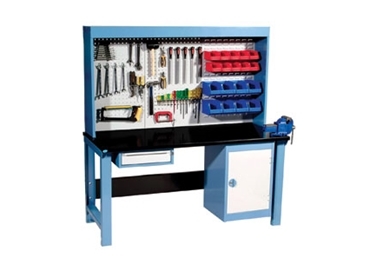 Sitecraft offers heavy duty industrial workbenches designed to provide ideal work and storage solutions for the maintenance fitter, technician, assembler and tradesman. Sturdy surfaces on the Sitecraft industrial workbench make it suitable for the toughest job. The heavy duty industrial workbenches are available in diverse options including extra heavy duty 3mm steel, medium duty 2mm steel, 38mm lacquered MDF timber top, laminate over timber top or 2mm stainless steel top for food and pharmaceutical applications. Industrial workbenches measure 1200mm or 1800mm W x 780mm D x 900mm H (to work surface). A height adjustable option is available, which allows workbench height adjustment from 750mm up to 1000mm in 50mm increments. Custom-sized workbenches are also available on request.